Thanks for sticking with me here, even though I haven’t been posting as often as I’d planned... I'll be taking yet another break, but I’ll be back soon in the new year, hopefully with more frequent updates. In the meantime, feel free to follow @threestaples at Instagram or @threestaples at Twitter for random stationery bits! Thanks again and I wish you a wonderful, peaceful rest of the year. This is the first of a small series of posts where I'll share what I've learned about Hobonichi and its Tomoe River paper. This is my second year journaling in Hobonichi. Once in awhile, I’ll take out my handmade rubber stamps and stamp them in Hobonichi Techo. It's a quick and easy way to add visual interest and color to my journal without the bulkiness that can come from decorative stickers or tapes. It's really fun to stamp! But I learned that not all ink pads are good for the thin Tomoe River paper that Hobonichi uses. I started using VersaColor ink pads at first and quickly found that the ink can bleed through the paper. Not fun! I used VersaColor on these pages. And the ink bled through the paper. Thankfully, I found that the chalk ink VersaMagic works really well, without much bleed-through. I assume it’s because it’s formulated to be powdery and opaque, even on dark paper and is less “wet” than the more general-purpose VersaColor. (I’m sure there are other brands/lines of ink pads that also work with the TR paper but I’m limiting myself to what I already own.) I still need to be patient while the ink dries, and it’s impossible for the impressions to be invisible through such thin paper, but I’m happy with how the VersaMagic performs. Even the black color works quite well! Testing various colors and designs with VersaMagic Dew Drop ink pads. Most of these designs were made from this book. The reverse side of the testing page. No bleed-through. Not bad, right? 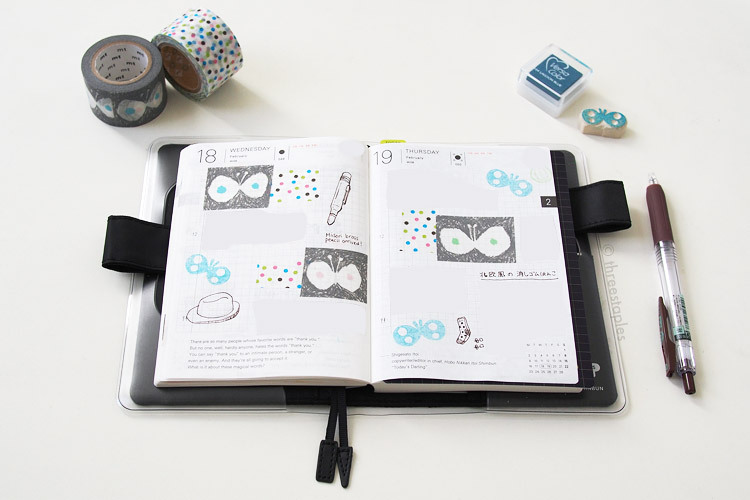 Do you use rubber stamps with Hobonichi or Tomoe River paper? What kind of inks work for you? 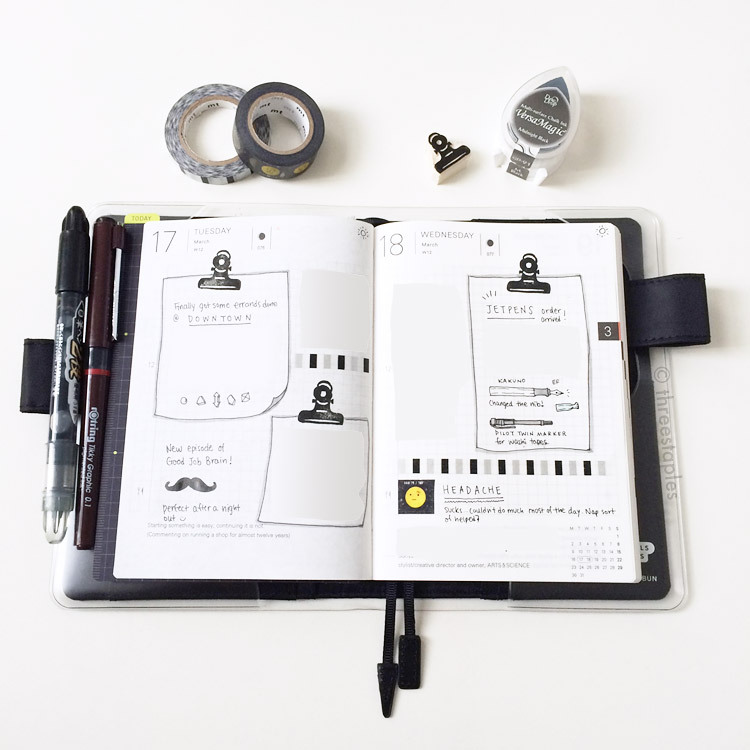 You can see more of my Hobonichi pages with rubber stamping in this post, or at my Instagram, with #jinnienichi tag. This is how I keep track of all the ink pad colors, in a Field Notes memo book, of course. 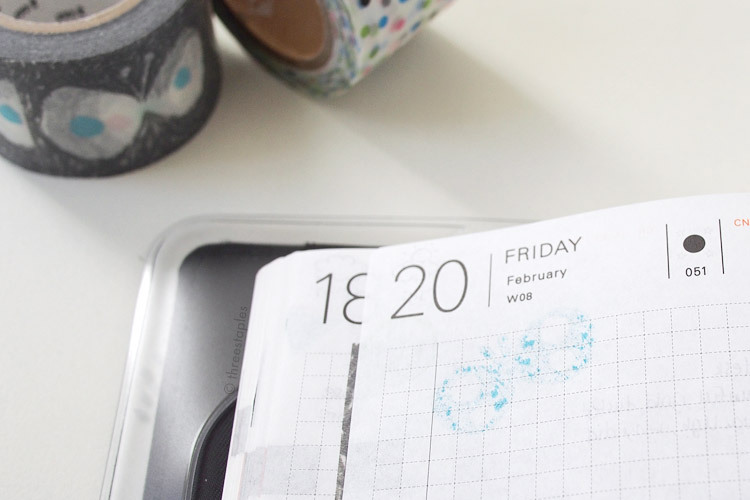 Sola at Pencils and Other Things discusses how the erasable Frixion self-inking stamps work on Hobonichi, in this post. 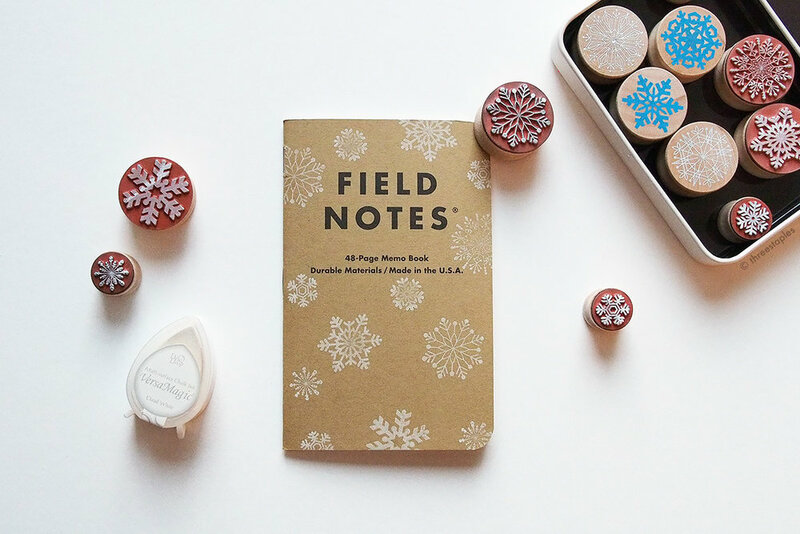 Need inspiration for hand-carved rubber stamps? I recommend Geninne's Art Blog, Mogerin, and Mizutama.